So these may get used for petty gods redux, but in the meantime, I think they're too cool to just sit on. 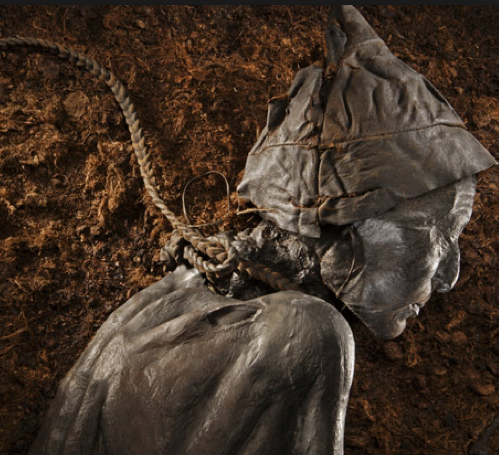 Bog-standard Bogmen are the remains of people who died after a long struggle to get unstuck from an ignominious death in swamps or tar pits. Just as the torches of the search parties were disappearing into the surrounding mire, these poor forsaken souls squeaked a last, pathetic plea for salvation and were summarily instilled with a mote of The Bogfather’s blasphemous quintessence. As years of erosion or human activity sometimes results in a situation in which a bogman becomes uncovered again, it will finally rip itself free of its prison as the first rays of moonlight touch it. A bogman desires to find living souls to take its place beneath the muck; and any humanoids it places there will rise in a similar manner the next night. Attacks: Choking mitts. If they hit, they automatically grip a human or smaller sized creature in a death grip (roll a d6 each round, add them together, if the total exceeds CON, the strangled target dies). Defences: Undead immunities; ignores non-slashing damage; melee weapons have a 50% chance of adhering to the tarry, muddy skin of a bogman. Roll under STR to get a weapon unstuck. Vulnerabilities: Flammable skin, but will attempt a bear hug if enflamed. Criminals in some areas are often hanged and given over to The Bogfather (a dark, petty god of swamps and coal) as a form of eternal punishment. However, sometimes a soul escapes the cool reach of The Bogfather's realm and returns to its body. 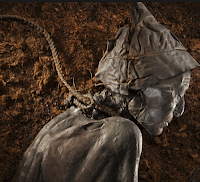 Preserved in weird ways by the acids of the swamp waters, Hanged Bogmen resemble soggy mummies. Attacks: Two claw swipes and a spectral noose (one noose at a time; target must make a reflex save to avoid). If it hits with the noose, the noose raises the character high into the air, where they are all but helpless and will soon choke to death, but if two companions jump on the afflicted and hold on for a round, the power of the noose will be broken. Defenses: Undead immunities; a slashing or piercing attack will release noxious gasses from the Hanged Bogman (save or choke for one round). Vulnerabilities: Will flee if presented with rope that is from the same coil that lies around their neck.